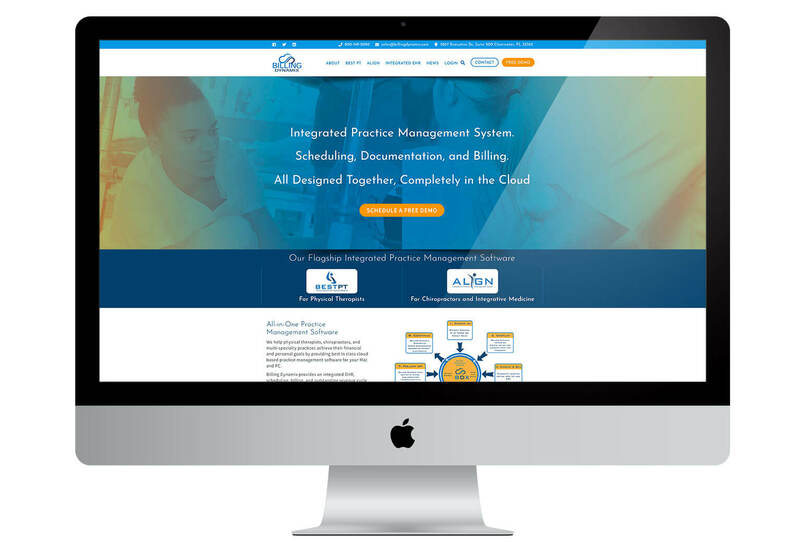 Billing Dynamix is a tech company that provides cloud-based software for Chiropractors, Physical Therapists, and Multi-Specialty offices. Everything on the site revolves around ‘Scheduling a Demo.’ Buttons are displayed in orange, which nicely contrasts the different shades of blue. Billing Dynamix promotes their Align software for chiropractors and Best PT software for physical therapists. Our objective was to make sure that the user knows which page to visit to learn more. Billing Dynamix plans on channeling Google ads to these pages so the pages had to be strong on their own. We used gradient overlays over images to create subtle backgrounds where text was still legible. The site uses a lot of icons, custom images and stock images, which were given graphic treatment. We wanted the site to look smart and fresh.